Seven grain free dog foods are one of the best when it comes to tasty, healthy meals for your pet. These foods are specially designed to cater for those dogs out there who may have a grain intolerance or sensitive tummy. Each recipie is signed off by an independant vet, so you know you are getting the right stuff. 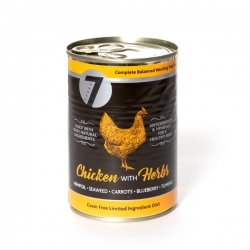 65% composed of Chicken Hearts, Chicken Meat, Chicken Liver, Chicken Stomach, Chicken Necks, 28,6% Broth, 3% Carrots, 2% Blueberry, 1% Minerals, 0,1% Turmeric, 0,1% Herbs, 0,1% Hemp Oil, 0,1% Seaweed.